Smile On Seniors is a unique volunteer program, created to enhance the lives of local seniors. Many of us have parents or family who are seniors, living alone or in senior facilities, that would greatly benefit from an extra visit from someone who isn’t family. Family can not always visit as often as desired, and not always is there someone else to supplement those visits. And that’s where Smile On Seniors steps in. SOS matches local volunteers with local seniors for a weekly visit, bringing joy and a sense of caring to many. Smile on Seniors is an innovative program that aims to meet the needs of the seniors within our community by connecting them with willing and capable volunteers such as yourselves. It has been proven time and time again that consistent human interactions can greatly impact the quality of life of the aged, and those who interact with seniors are in the position to accomplish atremendous amount. 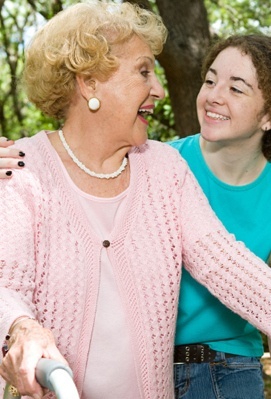 SOS is designed to enable seniors to develop intimate on-going relationships with volunteers. As part of the program, you are encouraged to develop meaningful conversations with your senior resident by sharing thoughts, stories, or relevant information to help them connect to their spiritual roots depending on their background. The time spent with the seniors will be utilized to its utmost so that they are able to benefit from and enjoy your visit as much as possible. Often the senior you visit will want to play cards or scrabble or listen to music with you. Many seniors that you will visit may not even want to talk but still want your company; they still want you to be there with them. There is no exact formula of how to interact with your senior resident. It’s important to open your heart and pay attention and let the person you are visiting set the pace and decide on the content. Bringing your children along on a visit is beneficial for both the seniors and the children. The seniors love the young company, and the relationship with the seniors has a positive effect on your family. Don't be concerned about the commotion that always accompanies kids. It can be a welcome change to the usually sedate home environment, and studies show that elderly people enjoy seeing and spending time with children. For more information or to contact us, please click here.